Get Reel (known as The Reel Thing in PAL regions) is a General minigame from Mario Party: Island Tour. The name is a pun on the term "get real", while the PAL name is a pun on the phrase "the real thing." The player winds the film back and forth before the minigame begins. 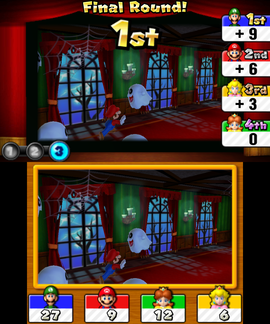 The objective of the game is to wind the film back and forth until the player can find the frame pictured on the Touch Screen. There are three films: a film with Mario running away from Peepas; a film with Mario riding on a paper airplane through balloons in the air; and a film with Mario jumping out of a Warp Pipe between two Piranha Plants. Once the player finds the correct frame, they must press to confirm. There are three rounds; the first player to find the frame gets 9 points, the second gets 6, the third gets 3, and the fourth gets nothing. The player with the most points at the end wins. Rules – NTSC "Wind the film back and forth to find the frame pictured on your Touch Screen." Rules – PAL "Search the film reel for the scene that matches the lower screen." Mario jumping out of a Warp Pipe with Piranha Plants. This page was last edited on December 3, 2017, at 16:43.